EnduroShield® uses state-of-the-art nanotechnology to transform automotive glass into a high performance, ultra-long lasting rain repellent surface. This non-stick, invisible coating turns rainwater into smaller beads which are easily swept away by the wind, ensuring clearer vision in wet-weather driving. In snow conditions, the repellent nature of the EnduroShield coating also reduces the surface adhesion of snow and ice, allowing easier removal. The effect of EnduroShield is similar to that of a non-stick frypan surface, where external particles are repelled and the surface is left clean. 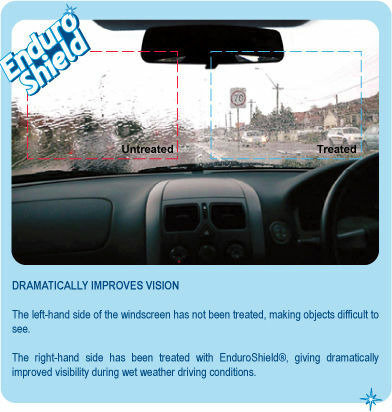 EnduroShield Auto Glass is effective on new and old windshields. EnduroShield is committed to the safety of those on the road. We’ve partnered with road safety experts to help make driving safer – beginning with improved visibility. Below are a few simple driving tips that can make a real difference to your safety on the road. At the bottom of the page, you’ll also find a range of useful links to other safe driving resources.